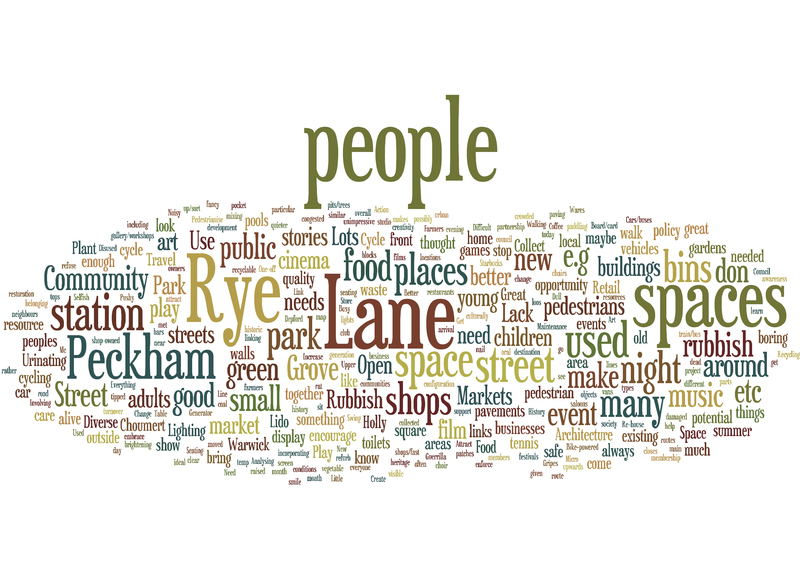 This is a ‘Wordle’ of all of the comments participants at the Co-Discover workshop made on the ‘Challenges and Opportunities’ and the ‘Gripes and Ideas’ boards about Rye Lane. The more the word appeared the bigger it is in the wordle. To look closely click on the image and then click on it again to zoom. Information gathered from the map will form part of the next workshop too but is slightly harder to unpick, however you can click on the image of the map in the previous post to see it in detail. – Peckham Plex space – square used as corridor screen above entrance to be used for art, to encourage people to look up! – Great station – show it off! – Franks given opportunity for emerging young architects – do more of this! – Re-house the good shops that are being moved in refurb so it’s not all Starbucks! – Behind Mc. Donald’s is dreary, dirty – unimpressive. The areas needs cleaning + brightening up and further linking it to the new station square and the space opposite, directly in front of the cinema. – Lighting does not need to be boring – bring spaces alive at night e.g. strings of lights on trees! – Cycle Lane top of Rye Lane: No differing colours so pedestrians don’t always notice. – Markets are great but their locations are not thought through. They block access to public space rather than enlivening them. – Maintenance – 100 years of catch-up! – Expectations raised that can’t be met – £? – Too many saloons and nail bars! – Need to attract more people – maybe change location to a park? – Add more environmental considerations. – Action on: Urinating, spitting, dropping chewing gum – can we stop them? – Could we make shops’ waste a resource? – Too many betting/money shops! – Road surfaces + potholes esp. B’moath Rd. – V. busy; pedestrian pushing – not good! – Difficult to walk on Rye Lane! – Games club? Board/card games? Table tennis? If you have comments to make or you have an idea that hasn’t been mentioned above, don’t hold back, make a comment on here.